After reaching for the skies – literally – with his last directorial effort Thor, Kenneth Branagh is back on the ground with an action-thriller reboot that doesn’t stand out next to all the other action-thriller films around it but remains a great deal of fun all the way through. The most famous character from the library of the late Tom Clancy, Jack Ryan has gone through four different actors over the years – Alec Baldwin, Harrison Ford, Ben Affleck and now Chris Pine – and only now has been given a chance to reinvent himself for a new generation of audiences. But Casino Royale this isn’t; Shadow Recruit isn’t quite as sophisticated as that Bond reboot nor is it perhaps as memorable. What it does have in its favour, however, is its need to entertain and it most certainly does that. Branagh directs certain scenes with a sense of urgency, heightening the tension and leaving you on the edge of your seat in anticipation of what the next move is. It helps that we have a lead character we can root for, and Pine is well-suited for the rejuvenated role which updates his character and circumstances. Kevin Costner is fine as Ryan’s CIA mentor Thomas Harper (aka what Pa Kent SHOULD have been like in Man of Steel), while Keira Knightley’s character can be a little grating – not helped by a wobbly American accent – but nothing horrible. As the major villain of the piece, Branagh seems to be having as much fun in front of the camera as he is behind it. However, his character’s villainous motivations in plunging the United States into a new Great Depression remain unclear, and he comes across as yet another stock Bond villain reject. Apparently, most of these new characters as well as the story were not from any of Clancy’s original books and were conducted exclusively for the screen, making it very likely that writer David Koepp religiously watched back-to-back Bond and Bourne films during the developmental process and this is the result of that. The film is very fast-paced, moving all over the place at exceptional speed that there’s hardly any time to properly develop the main characters. Pine’s Ryan is more or less the typical spy hero while Knightley slowly becomes the nagging damsel in distress that he has to save. The spark in their relationship is definitely there, as is some instances of character development between them, but it’s never prominent enough to become fully realised. In addition, it is grounded in po-faced seriousness, again leaving very little room for light-hearted humour to calm the tense atmosphere. It’s probably how Clancy wrote the character in the first place, as this sort of humourless office drone (though one doubts it), but from an audience perspective it doesn’t do that much to make it a more enjoyable experience. That isn’t to say it’s not enjoyable, which it most certainly is. As stated, the many scenes of action and thriller suspension raise this movie above the other mediocre films of the same genre and they help it stand out as a fun movie to watch at the cinema or even on DVD. 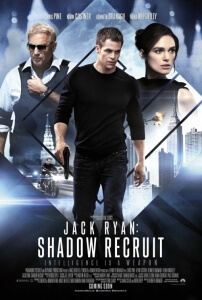 Though nothing special, Jack Ryan: Shadow Recruit does its job in entertaining as well as tell its own story which we wouldn’t mind seeing a follow-up to. Jack Ryan: Shadow Recruit is a decent action-thriller that’s sharply directed and tightly written, with fine performances from all involved. It’s no instant classic of the genre, but makes for highly-engaging entertainment nonetheless.